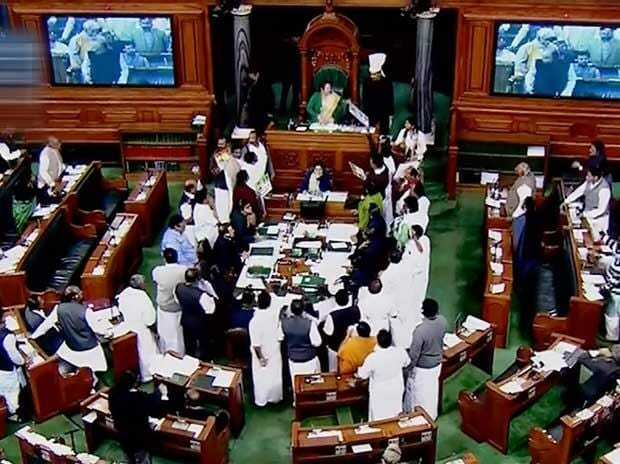 Lok Sabha was on Thursday adjourned for the day as members of the AIADMK and TDP continued to disrupt proceedings despite the Speaker suspending 21 more MPs for unruly behaviour. With the House unable to transact business due to ruckus by the two parties, Speaker Sumitra Mahajan ordered the suspension of the 21 members, including 13 of TDP and seven of AIADMK. The development came a day after 24 AIADMK members were suspended for the rest of the session for disrupting proceedings. As the House met on Thursday, AIADMK and TDP members trooped in the Well, raising slogans and carrying banners demanding the stalling of a dam on river Cauvery and special state status to Andhra Pradesh, respectively. The AIADMK members flung papers towards the chair several times. Amid the ruckus, Parliamentary Affairs Minister Narendra Singh Tomar appealed to the agitating MPs to return to their seats. However, protests by the unrelenting members of the two southern parties continued. At this, the Speaker initially warned that she would be forced to name the unruly members and take action against them. "I warn you, I will take you names. You have come to the Well and are persistently creating trouble," she said. Soon after the house met again at 2 pm, the suspended members of AIADMK and TDP trooped into the Well of the House continuing their protest and shouting slogans. Two more TDP members -- P Ravindra Babu and Kesineni Srinivas -- were also suspended from the Lok Sabha for unruly behaviour. Two questions were taken up during the Question Hour even as the members continued to shout slogans. Members from the Congress wanted to raise the Sabarimala issue and Mahajan told them that the matter can be raised later. Defence Minister Nirmala Sitharaman was expected to respond to the Congress party's allegations on the Rafale deal in the Lok Sabha on Thursday. Congress President Rahul Gandhi on Wednesday said Prime Minister Narendra Modi "does not have guts" to come to Parliament and confront questions about the Rafale deal. At a press conference later, he used an audio clip to allege that Goa Chief Minister and former defence minister Manohar Parrikar was "blackmailing" Modi with a file on the Rafale deal. Here are live updates on the Rafale debate, Cauvery issue, Triple Talaq Bill. Parliament passes Bill that scraps 'no detention' policy The Rajya Sabha on Thursday passed after a brief discussion the Right of Children to Free and Compulsory Education (Amendment) Bill, 2019, that seeks to scrap the "no detention" policy up to Class 8th for improving "learning outcomes". (Read more here) However, the Bill empowers the state governments to either scrap the "no detention" policy or keep it intact. The Lok Sabha has already passed the Bill. As per the old policy, children could not be failed in examinations, and their promotion to next class could not be withheld up to Class 8. Rajya Sabha passes National Council for Teacher Education (Amendment) Bill The Rajya Sabha on Thursday passed the National Council for Teacher Education (Amendment) Bill, 2019, that seeks to retrospectively grant recognition to certain institutions running teacher education courses as well as grant retrospective permission to start new courses. The Bill amends the National Council for Teacher Education Act, 1993. (Read more here) 1) The Bill grants retrospective recognition to institutions which offered teacher education courses after the establishment of the National Council for Teacher Education (NCTE) until the academic year 2017-18. 2) The Bill also seeks to grant retrospective permission to start a new course or training in teacher education to institutions which satisfy certain conditions and which have offered teacher education courses after the establishment of the NCTE until the academic year 2017-2018. Rajya Sabha runs smoothly for first time in Winter Session The Rajya Sabha on Thursday functioned smoothly and completed the zero and question hours for the first time in this Winter Session of Parliament. (Read more here) The session has seen a washout amid protest by AIADMK and DMK members who would come near the Chair's podium and shout slogans against Meketadu dam on the Cauvery river in Karnataka. As the members refused to budge, the Speaker suspended 11 TDP MPs, seven AIADMK members and an unattached member under Rule 374(A) for the next four sitting of the House. Among the suspended MPs were former Civil Aviation Minister Ashok Gajapathi Raju (TDP), Thota Narasimham (TDP) and Renuka Butta (unattached) who had won on a YSR Congress ticket. Proceeding in the Lok Sabha during the winter session that commenced on December 11 have been repeatedly stalled due to protests by AIADMK and TDP members over a proposed dam on river Cauvery and special state status to Andhra Pradesh, respectively. Action against such a large number of MPs is unusual. In February 2014, the then Speaker Meira Kumar had suspended 18 MPs from Andhra Pradesh following bedlam in the House. Those suspended then were either supporting or opposing the creation of Telangana. PM Modi has fled Parliament and his 'open book Rafale exam': Rahul Gandhi Escalating his attack on Prime Minister Narendra Modi over the Rafale deal issue, Congress chief Rahul Gandhi Thursday said it seems the PM has "fled" his "open book Rafale exam" in Parliament and is instead lecturing students in Punjab. Gandhi's attack came a day after he said Modi faced an open book exam on the deal in Parliament and asked if he will show up at the exam or send a proxy. The Congress president had Wednesday also tweeted four questions related to the Rafale deal and demanded answers from the prime minister. "So it seems our PM has fled Parliament & his own open book Rafale exam & is instead lecturing students at Lovely University in Punjab, today," Gandhi tweeted on Thursday. Sushma Swaraj says every issue on Rafale has been clarified by Supreme Court. Rafale debate Mallikarjun Kharge, Congress on Rahul Gandhi asking for a one-to-one with PM on Rafale: He (PM) must answer, It's a direct allegation on him that he helped his friends. He's the leader of the House, where will he answer if not here?Why is he letting other people advocate for him?